Is Speaking in Sound Bites Still Important? Speaking in sound bites is more important than ever. Contrary to popular belief, it’s more about having control over the exact answers that make it into a story. At its simplest level, a sound bite is the bite-sized clip, (piece of sound or video), chosen for an interview. In print, they are just called quotes. Ultimately, this is the answer that made it to the story. Good sound bites give you more control over what gets chosen to print, and/or is often repeated in the promo. 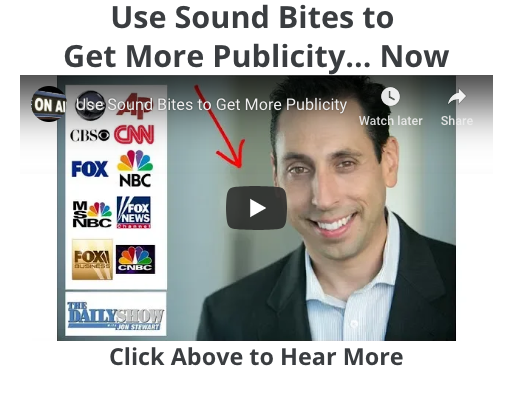 The current belief on sound bites is that politicians and celebrities use them to sound snappy. The problem is that most people don’t want to sound like a politician. Some perceive them as an interviewee trying to evade questions or force their agenda into the conversation. That is not the impression you want to make on the media. Media Training and techniques like sound bites should be treated like TV makeup. If it is applied correctly, no one knows it’s there. The person speaking just looks great. What Can Happen If You Don’t Use Sound Bites? Here’s the good news. We have created a unique Sound Bite System. This is a system where you can easily create a list of irresistible quotes. When we say irresistible we mean that the media will stop you in your tracks, and latch on to the answer you just gave. It is important to understand that sound bites are used in the paragraphs you speak. Just delivering short bite sized answers and nothing else sounds artificial, and frankly a little strange. Using our Sound Bite System combined with our unique Answer System, you can deliver thoughtful, articulate responses, which are “on-message” but also stimulate a reaction in the interviewer and audience. It’s no secret that one of our big goals in an interview is to get quoted. But more importantly, to get the RIGHT quote into a story. Every media interaction should have a goal. This means deciding in advance which answers or media messages you would like to deliver to the reporter or interviewer. Call or email us today to hear how we can help you specifically.